Creativity is an odd thing. Sometimes, restrictions impair creativity. You can almost sense how the weight of expectation and a desire to stick to a certain formula spoils some games. Sometimes, however, creativity feeds off restriction. 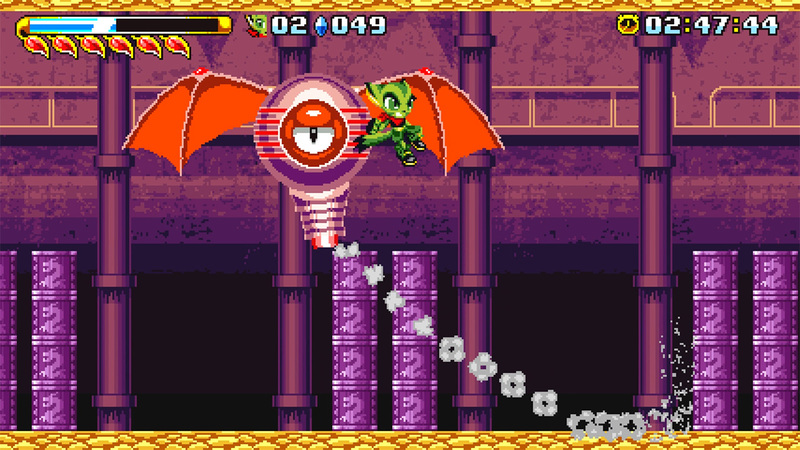 Freedom Planet started life as a Sonic fan game. Designer Stephen DiDuro clearly loves Sonic. But, by scribbling in the margins, he has managed to create a game that’s packed with creativity, albeit one that takes a while to find its feet. 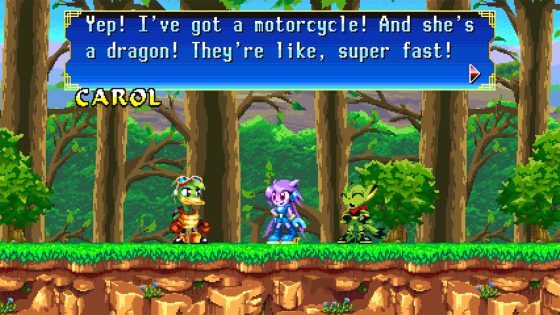 Freedom Planet starts with a choice of two characters. 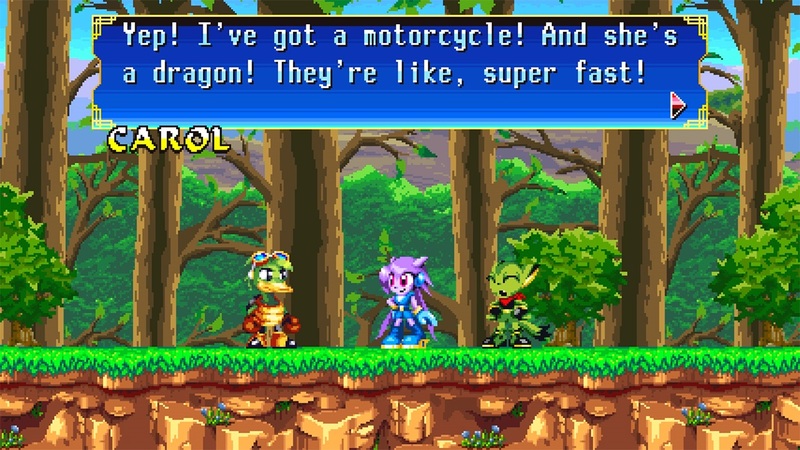 Lilac can double jump and has a mid-air dash, while Carol rides a motorbike. We favoured Carol. The motorbike is ridiculous. Not only can it ride along walls – it’s also possible to hang glide and use a zip wire while zooming along. It’s the ‘Sharknado’ of video games. Stupid, but fun and silly. From here, the typical run ‘n’ jump gameplay starts, although it quickly becomes clear that the game is filled to the brim with stuff to see. The second level took us over half an hour to complete, and that’s without re-tries. There’s also a decent amount of choice when it comes to taking different routes, with most alternate paths clearly visible. Completionists will be at home here. Not everything apes Sonic’s 16-bit hits, though, and some of the changes are more than welcome. 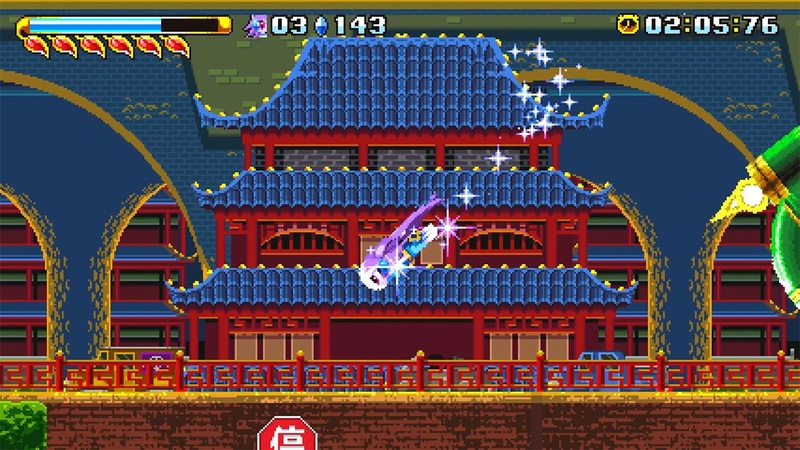 Freedom Planet has a bigger focus on combat, with each of the two main characters having a standard attack and a special attack. This means it’s much easier to maintain momentum than it is in Sonic games of yore. It also means boss fights can be more varied and interesting. Indeed, the boss battles in Freedom Planet are an example of when the game shines brightest. Some new ideas are less welcome. There are loads of fully-voiced cut-scenes. Between levels two and three we had to use the skip scene button five times. It reminded us why we hated the later Sonic games, with their endlessly chattering casts. Thankfully, classic mode removes all story elements and just gives you the good stuff. Bizarrely, when it sticks closest to the Sonic formula, it’s at its most creative. The third stage, Fortune Night, is gorgeous. Oriental dragons are spread across the landscape, providing platforms to skid along. Machines spit out treasures, and musical platforms – which play notes as you skip across them – bestow a caffeine-like hit of pure joy. The stages set on airships and underwater present new playthings, and the difficulty appropriately ramps up as things progress. There are also unique stages for each character, although we never really got much out of trying them. Characters have unique abilities, thus play slightly differently, but their skills aren’t really tailored to the levels, making them feel slightly superfluous. 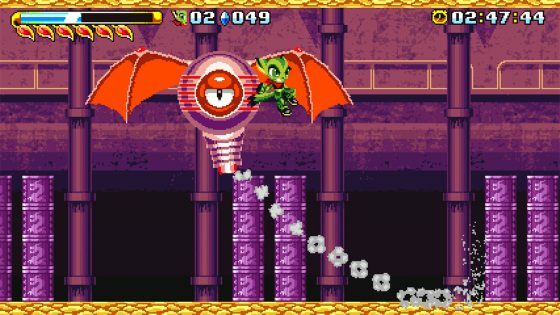 We should also note that Freedom Planet really looks the part. The animations have lots of flourishes (try standing still near a disco area) and the jaunty music is very reminiscent of the 16-bit era. However, we did notice what seemed to be some slowdown in boss fights. The boss at the end of level two seemed to be choppier than intended and collision detection was sometimes inconsistent, although not inconsistent enough to make us think that maybe, just maybe, constantly dying might have been a result of lack of skill. There’s just one problem when it comes to recommending Freedom Planet. Simply put, if you want to party like it’s 1992, Sonic Mania is still the place to go. But if you’re done chasing rings, but still have the itch to run really fast, then Freedom Planet should be your next port of call. The fact that it’s a close-run thing shows how much love, care and attention has been poured into this project.